As someone who enjoys playing trivia games, this just tickles me to no end. 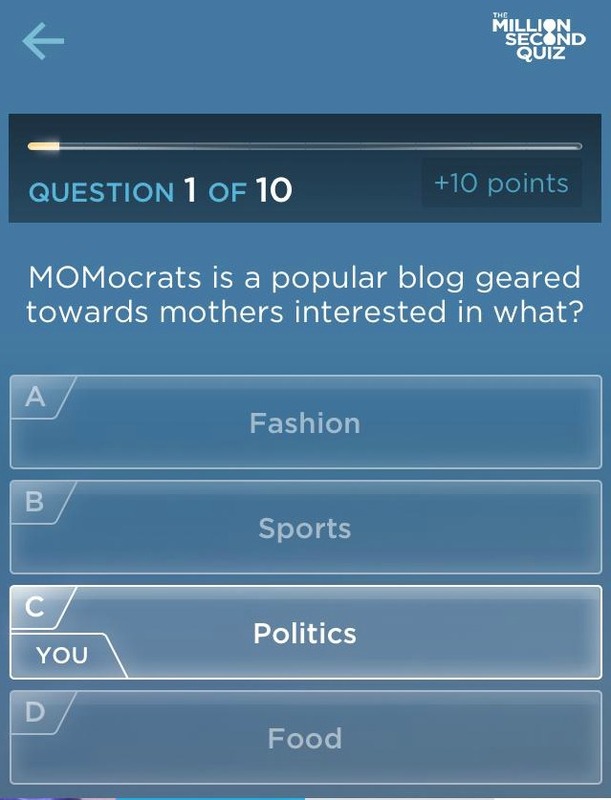 I also play with this app because the questions are so easy I had no trouble qualifying to be a contestant on the show. But if I had gotten this one, I probably would have failed to answer in the allotted five seconds, because I would have been so flabbergasted by it. Frankly, I’m surprised the person who sent this to me had the time to take the screenshot! I’m hoping it’s a good omen. A couple of weeks ago, I applied for a job that seemed absolutely perfect for me. Last night, I received word that I did not get the job. It truly was the nicest rejection letter I had ever received. It was a long shot and I knew it, but just finding that particular opening gave me hope that I can find something that is a good fit. So I keep looking. And who knows? Maybe I’ll get selected for the show and my penchant for remembering useless facts will finally come in handy. The Million Second Quiz Wants You to Be on It!